This fantastic Mediterranean cruiser is a great live aboard or day boat for up to 8 people. With a spacious cockpit and plenty of sun bathing space she can be enjoyed by family and friends. 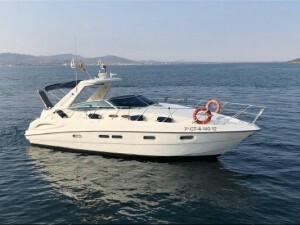 This 2004 Sealine S38 is a great example of this model and is lying near Cartagena ready for viewings. This Sealine S38 is powered by a pair of Volvo Penta 285Hp KAD 300C inboard diesel engines, which have been well looked after, and serviced annually. The engine hours are currently 700. This boat benefits from Raymarine navigation equipment, including a GPS chartplotter and radar, a hydraulic passerelle, teak cockpit flooring, generator, air conditioning, and all the safety equipment required by Spanish Law. The Sealine S38 can sleep 5, with a double master cabin forward and a triple cabin aft.